Altenburg & Wymenga, together with Wetlands International, developed a prediction model of the height of the annual flood peak in the Inner Niger Delta in Mali. The forecast model is used by the Direction Nationale de l’Hydraulique du Mali for the water management of the river. The model is developed and implemented under the BAMGIRE program, led by Wetlands International and financed by the Dutch government. 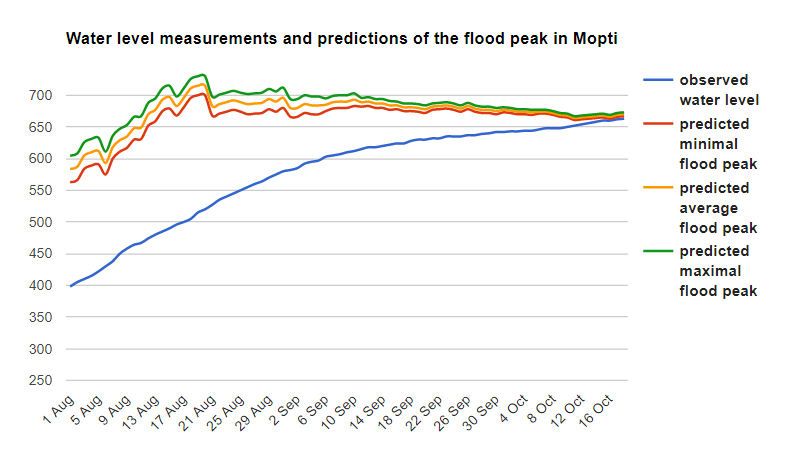 Example of the daily prediction of the height of the flood in the Inner Niger Delta in Mali in 2018 on the basis of the observed water level in Mopti (blue line) and the rainfall in the catchment area (www.opidin.org). The use of satellites for information about the weather has become common place as many people use the rainfall radar to know if rain is coming. In remote areas satellite derived information become..
Future-proof water management Better Wetter : How to adapt to climate change on a local level? Worldwide the water management of delta’s, rivers and coastal regions – often hotspots of biodiversity – is a major challenge, in particular in view of climate change and the dramatic decline..